LAMAR GILES writes novels and short stories for teens and adults. He is the author of the Edgar Award nominees Fake ID and Endangered, as well as the YA novel Overturned. He is a founding member of We Need Diverse Books, and he resides in Virginia with his wife. Check him out online at lamargiles.com, or follow @LRGiles on Twitter. WE NEED DIVERSE BOOKS™ is a grassroots organization of children’s book lovers that advocates for essential changes in the publishing industry to produce and promote literature that reflects and honors the lives of all young people. Their mission is to put more books featuring diverse characters into the hands of all children. 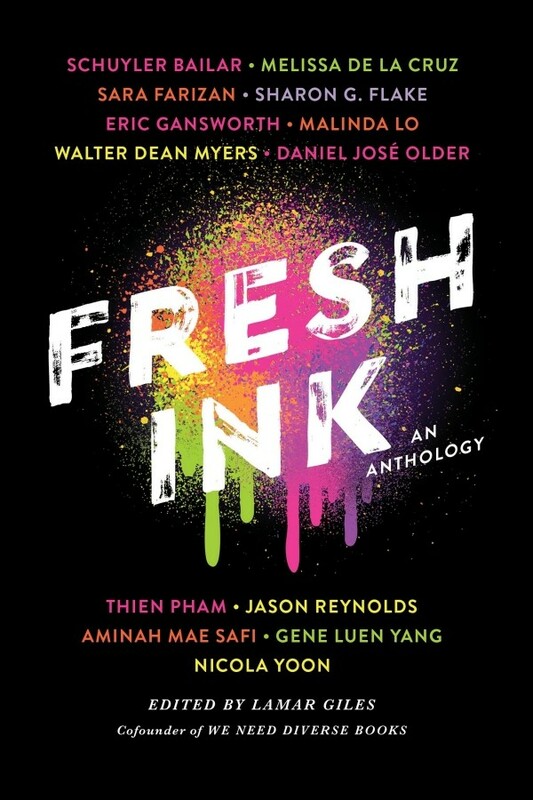 One winner will receive a copy of FRESH INK. This sounds so exciting! Good luck with the anthology. I've been curious about his book ? Love, Love, love this cover!! It's an amazing cover. This sounds like a one of a kind book and I really can't wait to read this book!!! The cover is just bursting with color. Very eye catching. This sounds like a great collection of stories. I love the cover's colors. The synopsis sounds inspirational and emotional. The colors on the cover make it really pop. The synopsis sounds very interesting. Love the neon colors makes me think of a party. I'm a big fan of anthologies for the variety in viewpoints, and in this case, in format and genre. (A graphic novel! A one-act play!) I'm disappointed that this giveaway no longer accepts entries on the listed expiration date (as opposed to that date being THE LAST DAY on which entries can be submitted). As a woman on the autism spectrum who works in a library, I have both personal and professional investment in respectfully-diverse books. Publishing has a depressingly poor record regarding its treatment of ability. Characters with disabilities are frequently described via ableist terms and assumptions, but in this case, they simply seem absent. Maybe I'm wrong, but what struck me is that nothing in the synopsis communicated to me that ability is included in the anthology. I'm a big fan of anthologies for the variety in viewpoints, and in this case, in format and genre. (A graphic novel! A one-act play!) I'm disappointed that this giveaway no longer accepts entries on the listed expiration date (as opposed to that date being THE LAST DAY on which entries can be submitted). As a woman on the autism spectrum who works in a library, I have both personal and professional investment in respectfully-diverse books. Publishing has a depressingly poor record regarding its treatment of ability. Characters with disabilities are frequently described via ableist terms and assumptions, but in this case, they simply seem absent. Maybe I'm wrong, but what struck me is that nothing in the synopsis communicated to me that ability is included in the anthology.